I often get asked this question by my clients: Is slouching bad? What do you think? Somehow straight posture is considered ideal, and slouching posture is perceived as bad in out culture. If you also think straight posture is good and slouching posture is bad, let me ask you why? If we never be allowed to slouch when we sit, we all would be healthier and pain free?? If you think bad posture is related to more pain, literature doesn't seem to agree with you. We talk about posture a lot, but interestingly enough there's no literature that shows posture is related to pain. Let's say straight posture is ideal, so you decide to sit with perfectly straight posture. How long do you think you can sit still perfectly? Probably not very long. After sitting for a long time, what do we do instinctively? We get up and move, right? This happens regardless of what position we are in because we're putting pressure on the same places all the time and compromising blood flow to those areas. Straight posture may provide some advantages from a mechanical standpoint, but if you stay in the same position, you're compromising movement. The same thing for slouching posture. If you're in the same slouching position, then there's no movement and stress is constantly placed on the same areas, even more in some areas than in straight posture. Then you have exactly the same problem. What would be healthier for our body is to create a habit of changing our positions frequently or moving frequently so we're distributing stress more evenly. For this reason, I really emphasize creating more movement options so we don't get stuck in only one movement pattern. I often get comments from my clients that I have a "perfect posture." I always ask them what the "perfect posture" means, and many say it's perfectly straight. So, straight posture=good posture?? 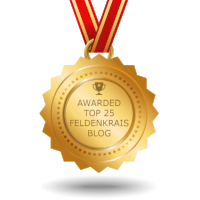 From a perspective of Feldenkrais Method it is a place from which you can initiate action in any direction with minimal preparation. You're basically ready to move any direction from ideal posture. You're not holding tension and staying rigid. I think people tend to confuse posture with position. Position is static. Posture is dynamic. Posture is action. Ideal posture should allow you to move more responsively. In contrast, if you're rigid and holding yourself as straight as you can, you may appear to have a good posture, but you won't be able to move as quickly. Not only that, you are straining muscles as you're making a lot of effort to maintain such a state. Masters of Tai Chi or Aikido all demonstrate great posture if you watch them. They're ready for actions. They are not tense. As a general rule, a good posture should never feel uncomfortable or tiring. Awareness Through Movement class will give you an experience of what it feels to have "good posture" that feels natural and authentic. If you ever played a team sport, you know how important it is that each player contributes to a game to make a great team, right? Even you have a very talented player on your team, it's very unlikely that your team will be good if only that one player works hard on the field/court. This same principle applies to our movements. For example, I worked with many clients with neck pain. They had neck pain when they looked up or turned their head to look behind. Most of the time they were mostly using their neck to orient head with very little movement in other parts of their body like mid back, shoulders/shoulder blades, ribs, hips, etc. The neck was the only player contributing to the work, sort of, while other players were hanging out and watching the neck doing all hard work. No wonder the neck got sore!! Neck pain, low back pain, shoulder pain, knee pain, you name it, but it's very common that people violate the team play principle. This is one of many principles taught in Feldenkrais Method & Martial Arts (Tai Chi Chuan, Aikido, Judo, etc). Check out my Awareness Through Movement classes & one-on-one Movement Re-education session to work on your "Team Play" skill!